Rain Deck has continually set the standard for advanced, interactive water play features. Our experienced design team, proprietary control systems, patented water treatment and recirculation systems allow you the ability to incorporate a large number of water features without having to waste water and your money! Rain Deck has advanced the application of splash pads in new and expanding environments never thought possible. Rain Deck Light-Commercial Splash Pad Products have all the benefits that are found in our Commercial Splash Pad Products but come at a lower price point. Rain Deck Light-Commercial Splash Pad Products bring incredible value to such places as Pre-Schools, Day Care Centers, RV Parks, Campgrounds, Small City Parks, Mobile Home Parks, Apartments, Condo Complexes – the applications are endless. Rain Deck Light-Commercial features are very affordable, and are often used in residential settings as well. With Rain Deck’s industry leading interchangeable products you can control the design of your splash pad by adding or changing any new feature with the popular Rain Deck Footing Base. Rain Decks Light-Commercial Products come in Stainless Steel, Fiberglass and High Strength PVC. Do you need a custom water feature or a unique paint scheme – Rain Deck can provide it all! Our professional design team can turn any project from a simple concept to a custom themed water attraction. 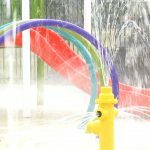 Rain Deck is your direct source for all things splash pads! Fill out the form or give us a call to see how we can help you put together your dream splash pad for your light commercial site! How many sqft is the site? 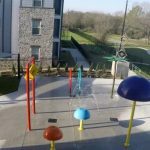 Below are the latest blog posts and news items about our light-commercial and commercial splash pad products.